Over the last year or so, we’ve taken a look at quite a few different watches in the Casio Edifice line (you can see those here). In many ways, you can look at these as a more refined cousin of what you’d see in the G-Shock lineup. 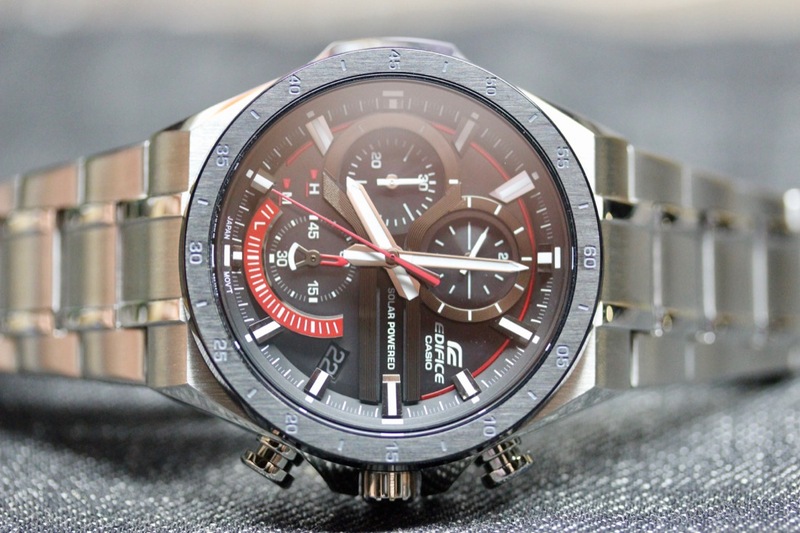 Today, we’re having a look at the solar-powered Casio Edifice EQS920DB-1AV. Now, long-time readers might be wondering what in the world I’m doing reviewing a chronograph. And, sure, it’s not a complication that I have much regular use for, but once you’ve got time and date, I’m not going to hold it against a watch once they’ve added in something like a chronograph. In this case, it brings the opportunity for some visual complexity on the dial. At first, the eye is struck by the red accents, as that is something that we’re not seeing much these days. I know blue is the popular color (and I’m a fan of that hue), but red is quick blast of color and it’s used to great effect here. It’s subtle and not overdone, but mixes things up. The more interesting aspect to the dial – in my book – is all of the different layers, angles, and textures that Casio has going on with the Casio Edifice EQS920DB-1AV. Some of it is to hide the solar panels, but Casio could have easily gone with a simpler, printed dial for the subdials and the like. Instead, we’ve got all sort of applied indices and semi-circles, and when it plays with the light, it really draws you in. In many ways, it makes the watch feel like a much more costly watch. One thing that didn’t feel as upscale was the bracelet. Sure, on a more affordable watch – particularly one on a bracelet – you’re going to expect some compromises. It’s a simple friction pin bracelet, and it’s one that’s a bit jangly. That, whatever, I can get used to that. What really bugged me, for whatever reason, was the fact that the watch couldn’t lay flat. Given how the links interact with each other, when you set the watch down, it’s actually standing up from the table. If you’re putting the watch in a box or whatever, perhaps not a big deal. For me, though, when I set a watch down, I like it to lay flat. So, perhaps something Casio can have a look at, how the bracelet links articulate. Once adjusted, I did find the bracelet – and watch itself – fit my wrist pretty well. Which is surprising, as this is a bigger case (almost 48mm diameter, and 55mm lug-to-lug). With all the steel, it comes in at 170g, so you’ll be thinking you’ve got a mechanical watch in play. It’s got a variety of polished and matte surfaces, which I like, as it picks up the light in interesting ways. It also minimizes fingerprints, while still allowing the watch to feel a bit more dressy, if the occasion calls for it.